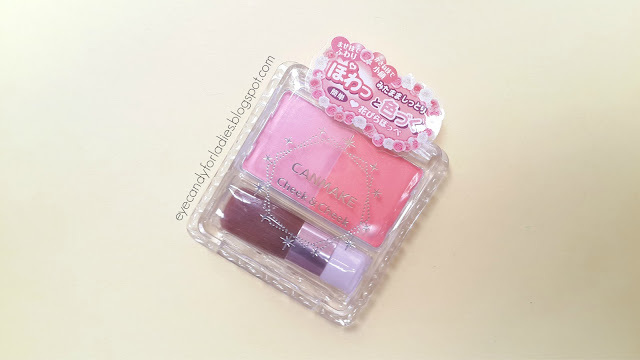 Another Canmake best selling blush-on! A subtle-glittery duo color blush-on that comes in one packaging; Canmake Cheek & Cheek. 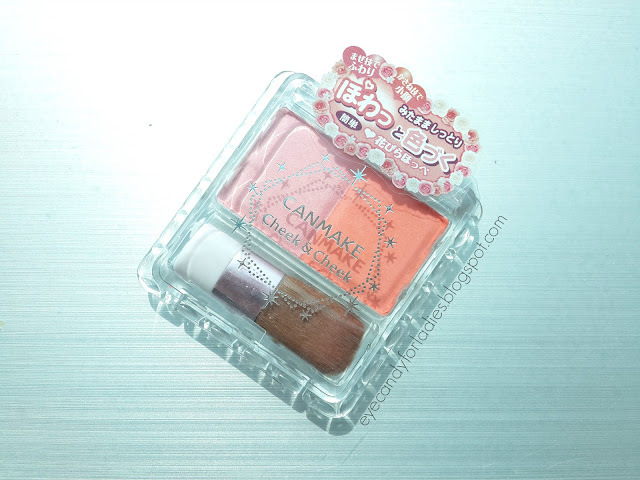 You might familiar with Canmake Cream Cheek but another must-have item for Japanese women is Canmake Cheek & Cheek; duo color blush-on which provides 2 different colors with finely milled glitter to create healthy flush cheek. "Have I told you that I won Canmake Indonesia quiz and received 3 gorgeous make-up products which is one of the product I reviewed here?" "Flower-like colors. High-color shades that will make it look as though your cheeks are suddenly flushed with happiness. The moist powder clings tightly to your cheeks. Use the two shades cleverly to make your face look smaller! Layer the two shades to discover your very own color!" Light and moist, clinging to your skin! ・ It's moist, even though it's a powder. Superb color, with just one sweep of the brush! ・ With just one sweep of the brush, you can create superb color that looks as though your skin has flushed slightly. Although it creates a high-color effect, it also projects an airy look, achieving an exquisite balance between the two. The dual shades enable you to make your face look smaller! 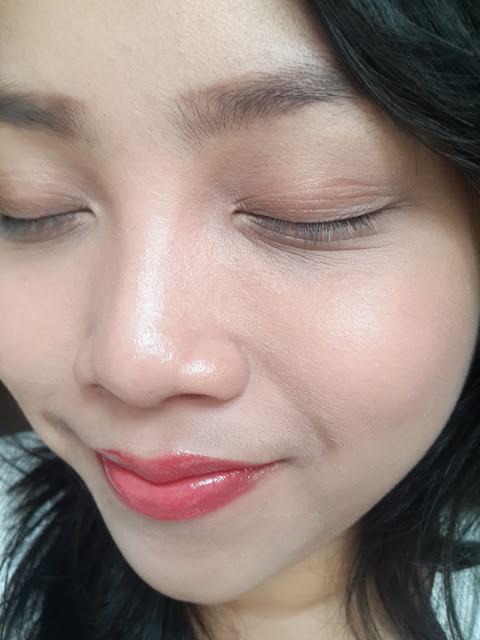 ・ Apply a circle of blusher to your cheeks and sweep the brush along the line under your cheekbone, then layer the other shade over the top, to make your face look smaller! Mix the two shades to create your very own original shade! ・ Mix the two shades together to create a fresh new color that you will encounter for the first time! Use alone or together - the combinations are unlimited! ・ Use Cream Cheek as a base, then layer Cheek&cheek over the top, to make the color last even longer! 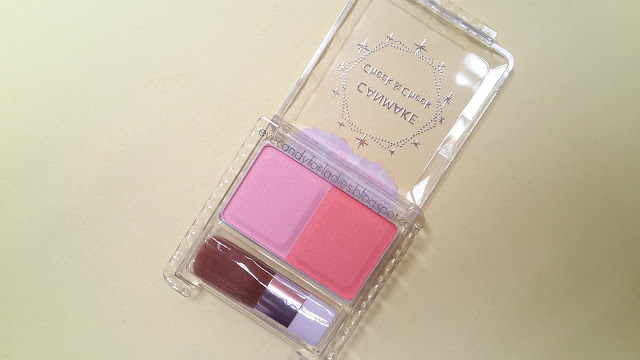 Canmake Cheek & Cheek often featured in Japanese beauty page as the most popular drugstore blush-on after Cream Cheek & Glow Fleur Blush-on. 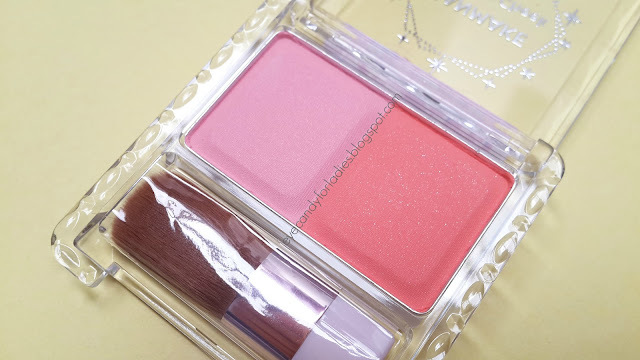 The blush-on is encased in a clear plastic case equipped with a synthetic brush which feels so soft. 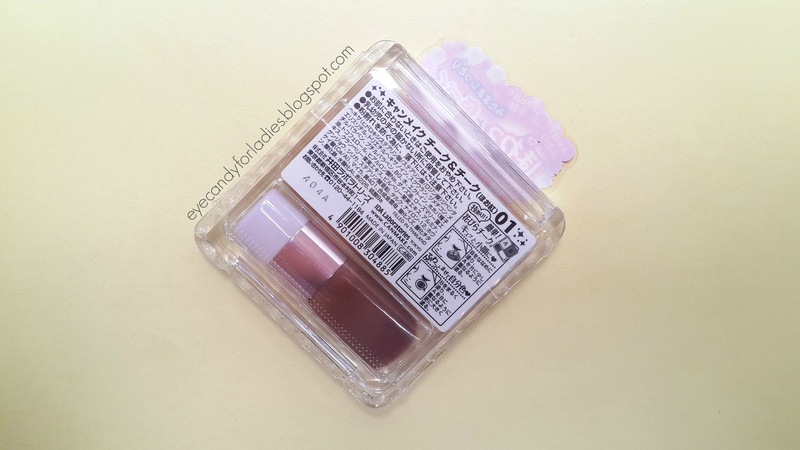 Product ingredients & information is written at the back side of the casing but unfortunately it's written in Japanese. However, you might follow the diagram shown for how-to instruction. 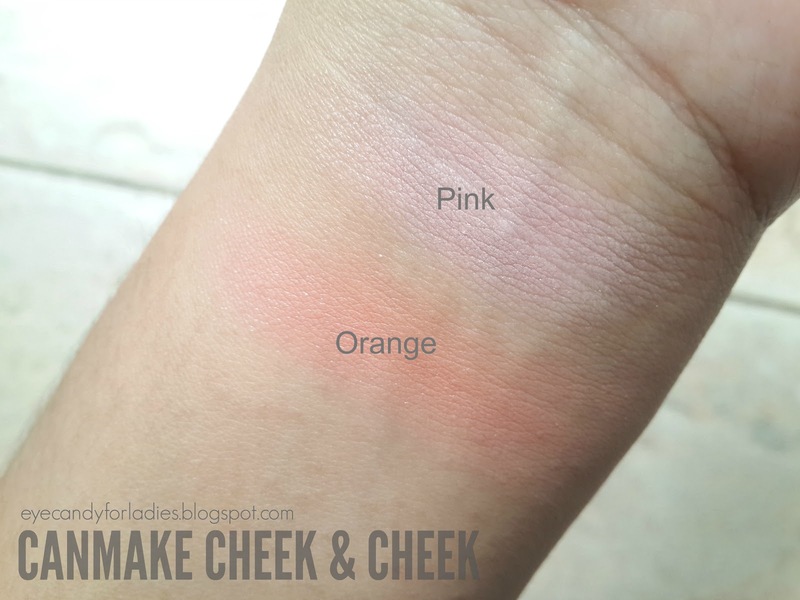 The texture of both blush-on shade is powdery-soft; as mentioned earlier the Cheek & Cheek is enriched with Squalane & Jojoba Oil to keep the cheek supple, whereas Hyaluronic Acid helps to moisten the skin so Cheek & Cheek won't easily create dry patches and drying out your skin. The glitter is finely milled and doesn't obviously shimmer on the skin upon application. Candy Flower pigmentation is subtly-pigmented yet gives radiant glow on your cheek. 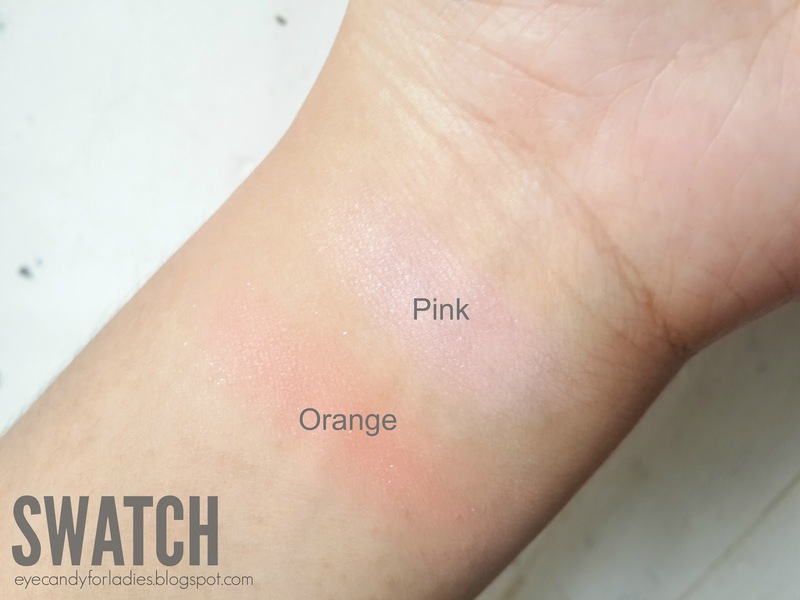 The Pink shade is a bit pale and subdued for warm-tone skin like mine but the Coral-Orange on the right side flaunts a healthy-flush finish. Staying power is average 4-5 hours and Cheek & Cheek is fragrance-free. This product looks very nice but I can't help but feel like it looks a bit cheap? Little girls' make up and stuff. Thanks for the review!